I recently found this great overview of cheap and simple hosting and Virtual Hosting solutions: lowendbox.com. It includes many providers of cheap hosting solutions for private and small business use. If you are able to manage your own server, e-mail and web site, there are many reasons you should take matters in your own hands. For the most basic use case, family e-mail and a small web site, it does not have to be expensive or take much time. Including your own domain, you should end up under 200 Euros / year. For only e-mail, or only web hosting, you might get by on the smallest of boxes offered, which is usually 128 MB of RAM. However, if you need both on the same machine, 256 MB is rather tight. For disk, somewhere between 10 and 20 GB should be sufficient. And the traffic / month limits are usually more than enough, often as high as 100 GB / month or more. CPU is usually never a limiting factor for a basic setup. So register a domain, rent some space, and become an Internet householder and landowner. I’ve discussed panorama robots in the past, and here is a new creation. James Catan has created several Lego robots to do timelapse and and pan/tilt pictures. One of them were recently presented in Gadget Review, and shows holding a Canon Rebel XT with a kit lens. So not quite 5D, 200mm f2.8 as with Jeffrey Martin’s rig. Yet still a good and simple setup. Another interesting pan & tilt product comes from Sparkfun. 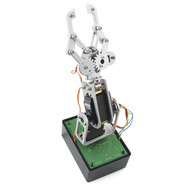 It is a robot arm, consisting of servos and and a claw. It will definitely not hold a SLR, but possibly some smaller pocket cameras or phones. As far as I understand, the complete robot arm comes in several parts which you’ll have to add to your order separately.